Church fellowship meals are always a lot of fun for us. It’s an opportunity for us all to take a break from everything going on to just sit and listen, or to share and encourage. This past week the theme for pot-luck dishes was “breakfast” and it has been my favorite so far. Just watching the sign-up sheet fill with enticing dishes was fun! Cinnamon rolls, pancakes, French toast… give me some butter can call ‘er done! The only thing about fellowship meals that I struggle with is the lack of produce. It’s probably the inner nerdy foodie in me, but 90% of our meals at home consistent of mostly produce. The only exceptions would be spaghetti night and pizza night. But even my homemade sauce is practically all vegetables and we’ve been aiming for more veggies on our pizza too. I understand how the lack of produce at the fellowship tables comes to pass – it’s so much easier to think of pot-luck dishes based around starches rather than those that aren’t. If it weren’t for those last 13 peaches staring me in the face every time I opened the garage door, I probably would have brought another starchy casserole too! Fortunately, the peaches inspired me to come up with a side dish that was practically all fruit and it’s exactly what the fellowship table needed: Oatmeal Peach Breakfast Crumble. In a large bowl, combine peaches, vanilla and ⅓ cup maple syrup if using. Set aside. In a separate large bowl, combine oats, salt and cinnamon. Cut in ¼ cup of butter using your fingers until the mixture resembles coarse breadcrumbs. The oats may cause large pieces to stick together, and that is fine. Add the peaches to the oats and mix to combine well. Taste the mixture and add additional maple syrup if desired. Pour into a 9x13 baking dish and dot the top with the remaining ¼ cup of butter. 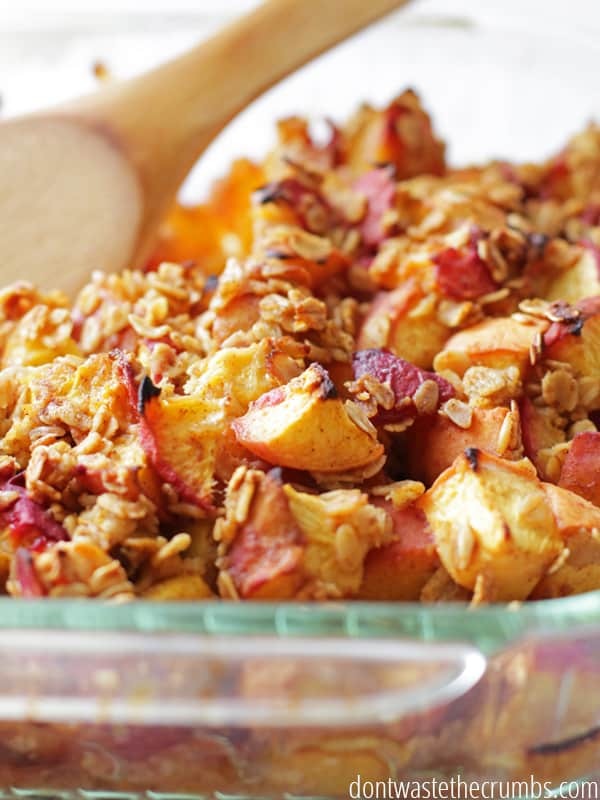 Cover with aluminum foil and bake for 45-60 minutes, until the peaches are soft and the oats have browned. The recipe can easily be halved to feed the average family. Another option is to make the full recipe and serve throughout the week at meals. Apples, apricots, plums, pears, berries… just about any baking fruit would make an excellent substitution. Consider changing the flavor of the vanilla extract for even more variety. Lemon extract with apricots or almond extract with cherries would be really good. The natural sweeteners in the fruit cause the recipe to be sweet on its own, so the maple syrup isn’t necessary. However, it does add a nice touch of flavor. If your family is used to sweets, start with 1/3 cup on the first try and gradually reduce it by one or two tablespoons for each subsequent batch. If you don’t want to dirty the two bowl, it’s possible to mix it all up in the baking pan (careful of fruit spilling over). You can also layer the oatmeal mixture on top for a different texture (pictured above), instead of mixing it all up. 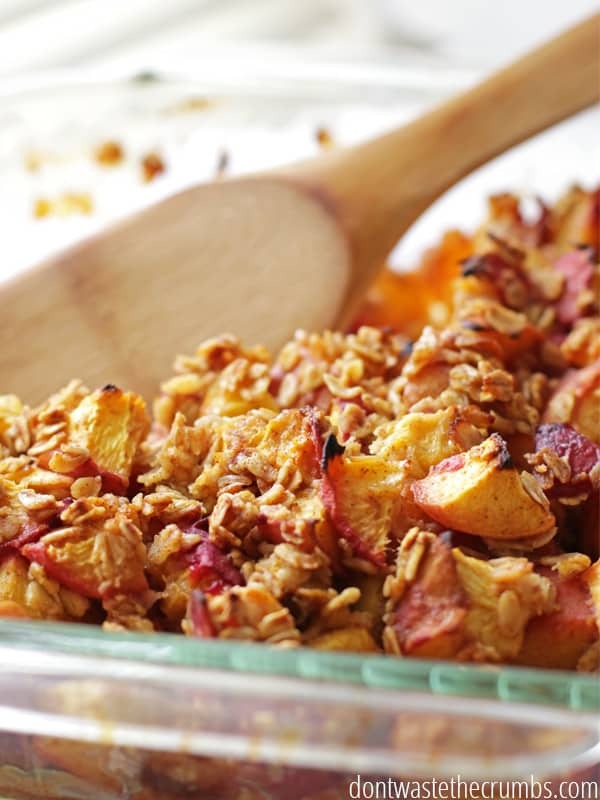 Oatmeal Peach Breakfast Crumble is definitely being added to my meal plan starting next week. The kids didn’t want to eat it (perhaps turned off by the browning on top? ), but it only took one bite before they downed their entire portions. I’m officially out of peaches… haven’t decided if that’s good or bad… so it’ll likely be made with a different fruit. I’ve got plenty of berries and some apples that are getting soft, so maybe an apple raspberry combination is in store. Side note: get new recipes via Facebook or Instagram by liking or following us! 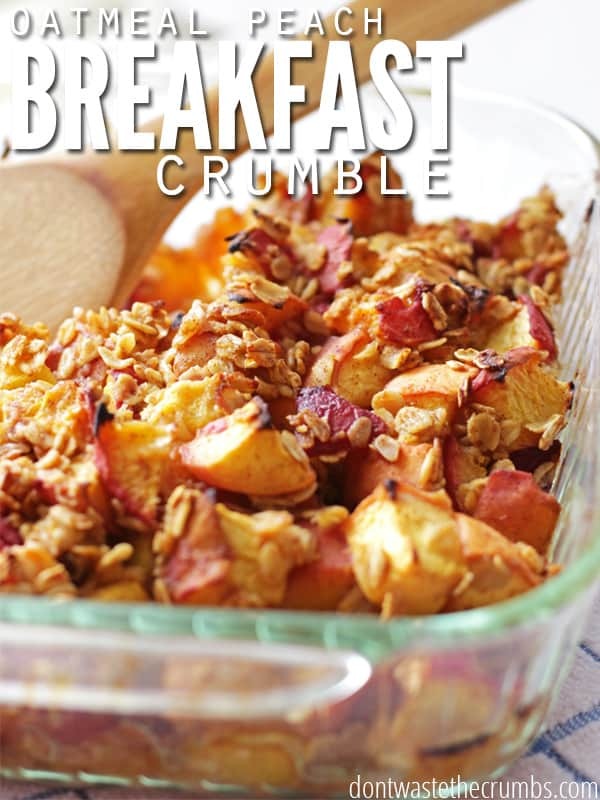 I’m open to suggestions for other variations of this oatmeal peach breakfast crumble dish – what flavor combinations would you recommend? Made this today with a small batch of organic peaches for a yummy breakfast. Even though not over sweet still deemed it desert for breakfast for its delicious taste. Reduced amounts to match my peaches and didn’t add that much maple syrup but made per the recipe other than adding pecans. Thanks for posting will be making again. I will do with organic apples when need to use up and think peach and blueberry together would be another winning combo. Hi! Did you soak the oatmeal before you used it? Would that have the same effect? Thanks! Hi Julee! I did not soak beforehand. It would likely have the same effect, but produce a bit more juices in the end. Definitely worth a try! Kelly and Ruth are SO sweet! So happy you found me too Julee! Can you use quick oats for this recipe? Yum! Just made this this morning! I did it a little differently….mixed everything together and threw it in a pan and then cut the butter into slices and laid it on top. SO delicious! Thanks for sharing! Love the simplicity Amy, and glad it turned out! Sounds yummy but what do you actually do with this to serve it? Eat it as cereal with milk? Eat it as a dry snack? Can this dish be made the day before. If so, how would I reheat it. Yes it can – prepare it all separately, fruit in a bowl and topping in another, then combine and bake the day of. Loved this breakfast dish. We had a huge supply of fresh peaches and it was a delicious alternative to regular oatmeal. It will definitely be a keeper. Thanks! How many cups of frozen fruit do you substitute?